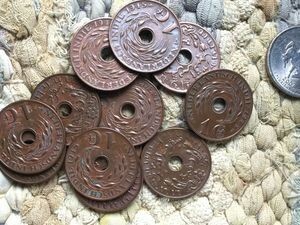 These vintage Indonesian 1 cent verdigris brass coins were minted in the 1940's bearing a NEDERLANDSCH INDIE inscription along with predominantly Arabic designs and writing (the Dutch were in control of the Netherland East Indies until 1942). 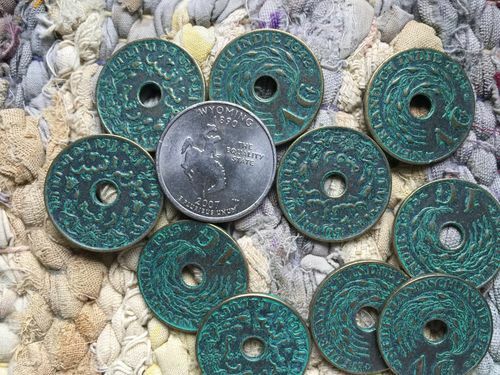 These are great coins with a wonderful applied verdigris patina that can be incorporated into tribal jewelry using the central hole. You will get a package of 10 used coins. 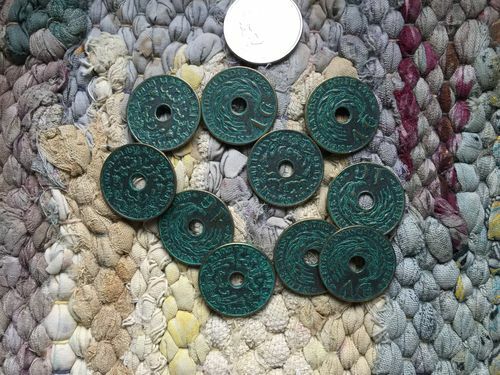 The coins measure 23mm in diameter (slightly less than 1 inch) and the center hole is about 5mm.